CFOs consider how to manage the financial risk of benefits while giving employees what they want — and need. Senior finance executives are increasingly treating employee benefits as an opportunity for competitive advantage, as they seek to balance their core fiscal-responsibility mandate with the need to support their companies’ talent management strategy. In the most recent in an annual series of surveys, conducted by CFO Research in collaboration with Prudential Financial, we found that finance executives were ready to move forward on a number of fronts. Three-quarters of them agreed that providing a balanced mix of health insurance, retirement, and group benefits was important for their company; the question is how to achieve this balance. 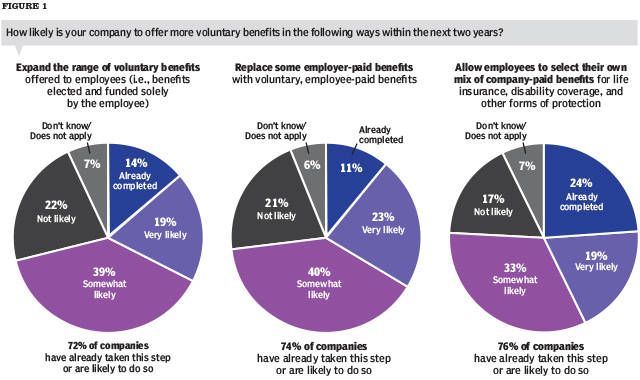 One of the clearest trends coming out of the survey is a move toward voluntary benefits, where employees are offered an unbundled selection of benefits programs to choose from. This à la carte approach seeks to strike a balance between the increasing cost of benefits programs and the recognition that benefits are critical to attracting and retaining the best employees. Seven out of 10 respondents agreed that offering voluntary benefits is one way to increase employee satisfaction with benefits while remaining cost-effective. A similar percentage said their companies are continuing to move toward greater use of voluntary benefits, and are likely to expand their range of voluntary benefits. (See Figure 1.) It’s clear that finance executives understand that more employee choice in, and ownership of, their benefits can result in higher employee satisfaction, and so higher employee retention. 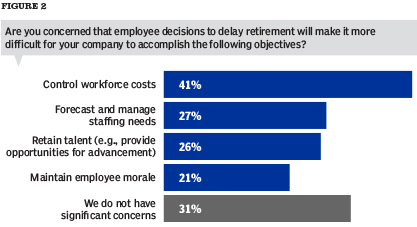 The flip side of employee retention is retirement planning. As with other benefits programs, providing a menu of retirement choices represents a balancing of company and employee concerns. The bottom-line concern is based on the thinking that employees with inadequate savings will postpone retirement and work to a higher average age, with a higher average cost of salary and benefits. Features such as automatic enrollment, stable value funds, and guaranteed income products are attracting more consideration from finance executives as companies tailor their defined contribution plans. More than a third of respondents said they already provide automatic enrollment, and another third said it is likely they will implement automatic enrollment within two years. Very similar percentages of respondents said they have adopted or will adopt employer-match contribution formulas to encourage higher savings rates among employees. Pensions: Transferring Risk The executives in our annual surveys have one additional consideration. All of the companies in the survey are managing either active or closed defined benefit (DB) plans—that is, pension plans. 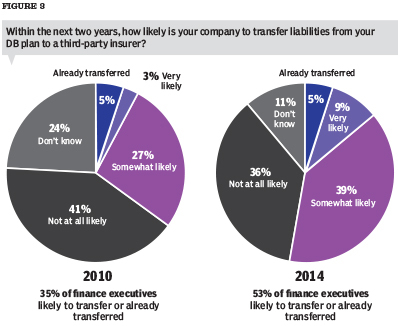 These respondents indicated that they are increasingly better positioned to consider risk-transfer options, which involve purchasing annuities for some or all of the obligations in a DB plan so that the insurance company can assume responsibility for administering and distributing the benefits. Improved company economics, mandated funding ratios, strong equity markets, and low interest rates are all factors that make the risk-transfer decision more feasible for many companies. But these finance executives acknowledge that the risk target is moving for them, too: Nearly two-thirds of survey respondents have modeled future pension contributions to account for increasing longevity. The volatility of DB plans’ asset earnings underlies the risk-transfer question, representing to finance executives a potential threat to earnings, balance sheet leverage, cash position, and growth investment capital. This year’s survey shows an increasing readiness to at least consider risk-transfer options. Half of the respondents also said that transferring DB-plan risk to a third party would allow them to focus more attention on managing their business. All in all, this year’s survey underscores the expanding role of finance executives in managing the business, not just the books. They are working with leadership teams on a range of solutions for funding growth in a stubbornly sluggish economic recovery.